Chateau Fortia is one of the older estates in Chateauneuf du Pape. In fact Chateau Fortia can date itself all the way back to its humble beginnings as a Southern Rhone Valley farm in 1763. Chateau Fortia was one of the larger vineyards in the region by the mid to late 1800’s. The property takes its name from the founder of the estate, the Marquis de Fortia. However, it took almost 150 years for the name of the property to recognize its creator. What we know of today as Chateau Fortia was a working winery starting in at least the early 1800’s. During early those days, Chateau Fortia increased its size with additional purchases. The beautiful estate continued to expand over the years. The first label displaying the Chateau Fortia name was produced in 1930. Today Chateau Fortia is owned and managed by the Le Roy family who have been in charge of the property since the early part of the 20th century. Located not far from the Chateauneuf du Pape village the 30 hectare vineyard is planted to grapes to produce both red and white wine. 2.5 hectares are devoted for white Chateauneuf du Pape, while the remaining 27.5 hectares are used for the production of red wine. Even though most of their vines are in one large parcel, the soils are varied. They have a terroir of sand, clay, limestone and large rocks in their soil. The vineyard is planted to mostly Grenache with Syrah and a bit of Mourvedre. 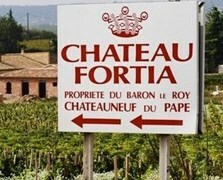 Chateau Fortia produces 3 red wines and 1 Chateauneuf du Pape Blanc. Chateau Fortia Tradition is a blend of 80% Grenache and 20% Syrah. The wine is aged for an average of 16 months in old foudres. Production is close to 3,500 cases per vintage. Chateau Fortia La Cuvee du Baron made its debut in 2001. The wine is blend of 50% Grenache, 45% Syrah and 5% Mourvedre. The wine is aged for an average of 16 months in old foudres. On average, close to 4,000 cases are produced each year. Chateau Fortia Cuvee Reserve was produced for the first time with the 2006 vintage. The grapes used for the wine are from the estate’s oldest vines. The wine is produced from one of the highest portions of Syrah used in Chateauneuf du Pape at 85%. The remainder of the blend of 15% Grenache. The wine is aged in foudres. Not much of this wine is produced. Production hovers at close to 350 cases per year. Chateau Fortia Blanc is a blend of 60% Clairette, 30% Roussanne and 10% Grenache Blanc. The production is close to 900 cases per year. Chateau Fortia is best when decanted for about 1-2 hours when young,. This allows the wine to soften and open its perfume. Older vintages might need very little decanting, just enough to remove the sediment. Chateau Fortia is usually better with 4-6 years of bottle age. Of course that can vary slightly, depending on the vintage. In the best vintages the wine should be consumed within 5-18 years after the vintage. Chateau Fortia is best served at 15.5 degrees Celsius, 60 degrees Fahrenheit. The cool, almost cellar temperature gives the wine more freshness and lift. Chateau Fortia is best served with all types of classic meat dishes, veal, pork, beef, lamb, duck, game, roast chicken, roasted, braised, stewed dishes, barbecue, sausage and cassoulet. Chateau Fortia is also good with Asian dishes, hearty fish courses like tuna, mushrooms pasta, eggplant, cheese and tomatoes. The white wine of Chateau Fortia is best served with a myriad of different seafood dishes, shellfish, crab, lobster, sushi, sashimi, chicken, pork and veal, as well as Asian cuisine. While the wines of Chateau Fortia in more recent vintages have clearly been improving, perhaps the best vintages from the famous estate were produced in the 1970’s. If well stored, they are definitely worth taking a look at. Pepper, smoked meat and red fruits are the first thing you note before moving on to the layers of sweet, lush, red fruits and spice on the palate. There is intensity and purity with a strong garrigue note in the ripe finish. The wine is made from 100% old vine Grenache..
Stony, spicy and peppery, the wine is full bodied and dark in color as well as in the fruit it offers. There is density and volume with freshness in the mineral driven finish. Give this some time in the bottle. The wine is made from a blend of 55% Grenache, 30% Syrah and 15% Mourvedre. The spicy notes from the Mouvedre and depth and backbone from the Syrah bring the Grenache home. Medium bodied and fresh with a stony character the finish, this is the best Fortia tradition I can remember tasting in ages. The wine is made from 50% Grenache, 25% Mourvedre and 25% Syrah. Meaty, peppery, almost robust styled wine, built around its spicy kirsch, herb and olive, structured character. Produced from a blend of 45% Syrah, 40% Grenache and 15% Mourvedre, it will take at least 5 years or more years in the cellar before it's fun to drink. Medium bodied, with dark, red, peppery fruits and freshness to the spicy finish. 50% Syrah, 40% Grenache and 10% Mouvedre is the blend. Soft and focused on its cherry filled charms, the wine is sweet, fresh and spicy. Made from blending 70% Grenache, 18% Syrah and 12% Mouvedre. From a whopping 80% Syrah, with the remainder of the blend taken up with Mourvedre, the wine is peppery, fresh, spicy and tannic. Ripe kirsch, freshenss and spice continue into the peppery, cherry finish. From a blend of 44% Grenache, 44% Syrah and 12% Mourvedre. Earthy in its essence, everything is correct and in the right place, but there is a lack of excitement in this 60% Grenache and 40% Syrah blend. Bright, fresh, herbaceous red fruits and a crisp red cherry finish. The wine was produced from a blend featuring a whopping 44% Syrah, 44% Grenache and 12% Mourvedre. Light ruby in hue, this medium bodied, earthy, cherry dominated wine is already open and ready to drink. From a blend of 50% Syrah, 40% Grenache and 10% Mourvedre, this is one of the heaviest concentrations of Syrah in Chateauneuf du Pape. This concentrated wine offers sauvage aromas, soil, barnyard, plum and earth along with meat or beef blood. This traditionally styled wine ends with a long finish. Strong barnyard aromas that reminded me more of Mr. Ed's stable than wine, it took a while to move past the animal scents to find black cherries and earth. The wine has depth, and some people are going to like it a lot more than I did, but the only way this was going to rock my boat, was if I was going to sea in an Ark. It's a shame because Fortia was one of the better Chateauneuf du Pape wines during the 1970's. Fully mature, this rich, full bodied, concentrated Chateauneuf du Pape is filled with ripe, jammy cherries and fresh, strawberries. Lush, and lusty, 2003 Fortia is drinking in its sweet spot today. 1970 Forita was old, tired and running out of steam. Perhaps other bottles are better. Being my last bottle, I was happy to have shared it with my friends. I've had better bottles. But if this bottle was correct, it's not a wine I would buy in today's marketplace. Murky, ruby in color. Jammy, wild strawberry with cherries, beef blood and leafy aromatics started off the perfume. Not many Chateauneuf du Papes will be better at twenty than they were at ten, but at 40, the 1970 Fortia throws out all the rules. In the mouth, thick layers of red and black peppery, ripe fruit and plums with a minor hint of sweet and sour fill your palate with flavor. I doubt this will improve, but who cares at this stage of the game?